Inder Loves Folk Art: Visiting Miles. Some photos from our recent trip to New York City! We stayed in Park Slope, Brooklyn with our wonderful friends and hosts Melissa, Robin, and Miles (of the fabulous blog, Miles and Moms). We had a great time in NYC. Highlights of the trip: Pizza, deli sandwiches, bagels, cannoli, Columbian food, Indian food, Buffalo wings ... well, you get the idea. When they weren't keeping each other up all night with alternating crying, Miles and Joe played together beautifully. Well, Joe never threw a temper tantrum on top of Miles, at any rate. And there was a lot of playing, strolling, laughter, and giggling. Two babies, watching trucks drive by, hoping the nice garbage truck guy will adopt them. Miles plays with his toy drum. That person to the right? Definitely not his nice mommy. Miles eats yogurt. He only gets a small ration. This yogurt ration is serious business! Don't let these kids fool you with their serious expressions - there was a whole lot of FUN happening on this trip! I just didn't quite catch it on film. It's a Schroedinger's cat problem. When I try to take video of Maeve these days, she stops doing whatever cute thing she's doing and starts wailing because I won't let her play with the video camera. 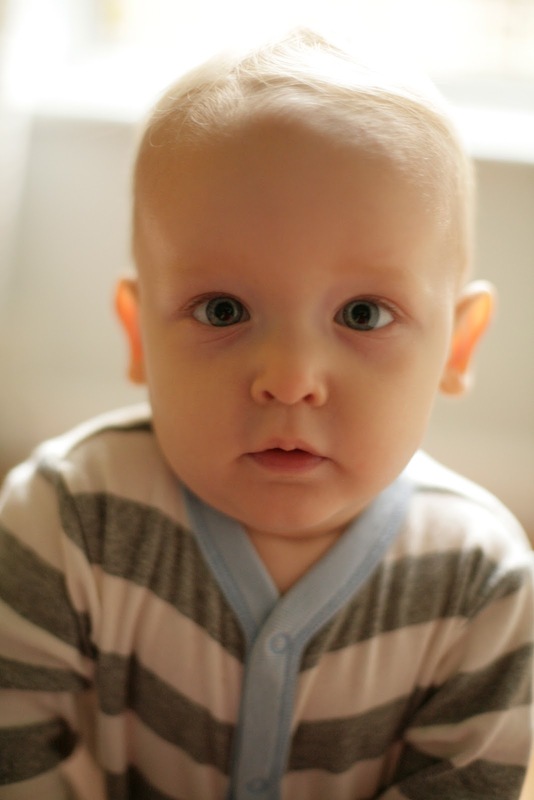 Dress your baby in stripes! The great avocado mystery: A graphic screenplay.